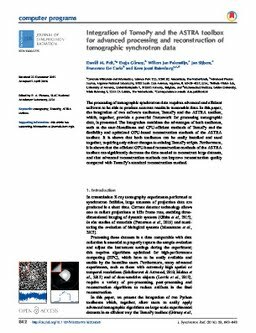 The processing of tomographic synchrotron data requires advanced and efficient software to be able to produce accurate results in reasonable time. In this paper, the integration of two software toolboxes, TomoPy and the ASTRA toolbox, which, together, provide a powerful framework for processing tomographic data, is presented. The integration combines the advantages of both toolboxes, such as the user-friendliness and CPU-efficient methods of TomoPy and the flexibility and optimized GPU-based reconstruction methods of the ASTRA toolbox. It is shown that both toolboxes can be easily installed and used together, requiring only minor changes to existing TomoPy scripts. Furthermore, it is shown that the efficient GPU-based reconstruction methods of the ASTRA toolbox can significantly decrease the time needed to reconstruct large datasets, and that advanced reconstruction methods can improve reconstruction quality compared with TomoPy's standard reconstruction method.